German shrapnel sliced through a nerve in his leg that left it partly numb forever. Stepping through a puddle of pig manure left him cold and smelly in the middle of a bone chilling night. Enemy bombs blasted dirt into his frozen foxholes as he and his men fought for every inch in the snow-covered fields and small towns of France, Belgium and Germany during the Battle of the Bulge. James K. Cullen of Roxbury proudly endured all of this and much more as an infantry Staff Sargent in Europe during World War II. After 60 years of relative silence, 95-year-old Cullen has published his story in the book “Band of Strangers.” His narrative balances well researched military history with visceral personal anecdotes. The tale gives twenty-first century readers insight about what it was like to battle when the world had no iPhones, drones or Internet. Overall, the book is a testament to what Cullen recently called “the American spirit.” A Scottish immigrant, Cullen only received his citizenship after being drafted into the Army. Like today’s Dreamers, he said he always considered himself an American. As a Drill Sergeant he trained infantrymen in the States then volunteered for action overseas. He commanded replacement soldiers thrown into battle together at the last minute. “I didn’t know anything about them, except could they shoot straight, obey an order, be brave enough to be there and knock out the enemy.” Together they formed the “spearhead” of the Army’s 3rd Armored Division, 36th Armored Infantry on Normandy. The men bravely cleared the way for American tanks to roll across Europe in constant confrontation with “Jerry”. “The Germans were very good at camouflage in the hedgerows in Normandy. The field was surrounded by brush that was centuries old – trees and brush and dirt. We would be on one side and the (Germans) would be in the other and we wouldn’t see him,” Cullen explained. He said his troops would cross the field thinking they were in the clear and machine guns would “open up” on them. Cullen was wounded twice in combat. 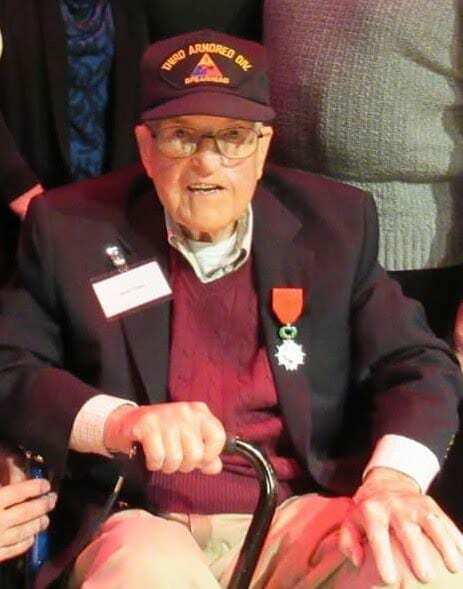 His combat decorations include four battle stars, a Purple Heart with Oak Leaf Cluster, a Bronze Star, a Combat Infantry Badge and the Belgian Fourragere of 1940. After the war, Cullen returned to civilian life in the States. He went to college on the GI Bill. He married, had a both a family and a successful career. Through the years, he said people continued to ask him for information about deceased relatives who may have fought near him. Eventually, after speaking with his wife Carol, he decided to get some memories down on paper. He began the writing process with pen and a spiral notebook. “I had done a lot of research about where I was. I had gone to the archives in Carlisle (Pa.) and Washington, but there wasn’t a lot of detail about what had happened to the squads,” he said. He had to keep digging and contacted historians overseas to get help with details such as battle locations. On September 11, 2001 Cullen said he felt a kinship with the passengers of United Airlines Flight 93, whose actions foiled the efforts of their aircraft’s hijackers. “Flight 93 happened in conjunction to what I was writing about,” he said. Like the passengers, he and his men were… “ordinary citizens. We didn’t know each other. We were chosen to go overseas and confront the enemy.” The way Cullen saw it, the people on Flight 93 banded together in the moment as he and his troops did to triumph over another threat to our nation. Terrorists and technology have created a very different battleground for today’s warriors, Cullen noted. “Drone pilots,” he said. “I feel sorry for some of the guys that operate the drones. They sit somewhere in the states and at 5 p.m. they go home to eat dinner. They’re not really active pilots. Their targets are like 4,000 miles away,” as apposed to the “very personal” old style of WWI and II where they went up and flew planes in person. These days, Cullen does his best to bring the dry words of textbook WWII history to life. 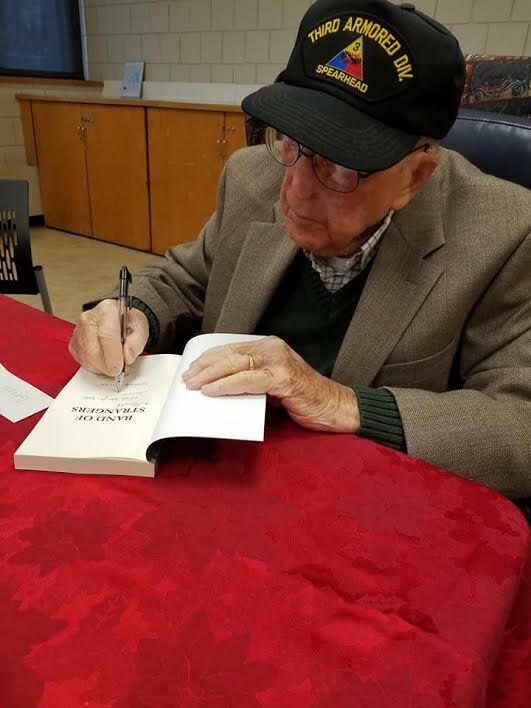 He speaks to students all over northern New Jersey with a Battle of the Bulge Group and attends various World War Two Reenactments “We have talked to about 13,000 kids with artifacts such as …(ammunition)… helmets and K rations,” he explained. He has also had a reunion of sorts with the armored vehicle that carried him across Europe. A collector in Connecticut recreated the half truck/half tank which Cullen’s squad named Eleanor. As a special nod to his father’s military service, James K. Cullen II, also a veteran, organized a visit for his father. Cullen has dedicated his book to his wife Carol, who helped transcribe his story. Daughter Cathie, son Jim and daughter-in-law Kat helped proof read. Grandchildren Allegra and VJ encouraged him throughout the process. While he doesn’t expect to write a sequel, Cullen is delighted by reader’s responses to his memoir.